It’s a testament to the richness and variety of Chicago’s music scene that one can hear first-class artists and world premieres without ever having to venture downtown. The Saint Paul Chamber Orchestra opened its annual residency at the University of Chicago Friday night with a generous program featuring soprano Dawn Upshaw in not one, but two song-cycles including the debut performance of In the Land of the Lemon Trees by Alberto Iglesias. The Spanish composer is better known for his film scores than concert works, as a regular collaborator with Pedro Almodovar (Talk to Her, Volver) and an Academy Award nominee for The Constant Gardener and The Kite Runner. Commissioned by the Saint Paul Chamber Orchestra, Iglesias’s cycle sets three poems: Last Echo by John Ashbery, Voyageurs by Rene Char and The Poem that Took the Place of a Mountain by Wallace Stevens. Iglesias’s renamed movements (The Sprayed Poem, La Reine des Oiseaux, and Ascending the Metaphor), paint a searching metaphysical journey to find meaning in a meaningless universe. The composer’s style is essentially tonal with some astringency and Minimalist chugga-chugga. An amplified flamenco guitar underlines the Spanish flavor of the settings, though the first movement is rather thickly scored and conductor Miguel Harth-Bedoya sometimes swamped his light-voiced soloist. The heart of the work is the extended Rene Char setting and, in addition to her fine French diction, Upshaw conveyed the music’s sense of rhapsodic longing, as well as the more elliptical spareness of the final Stevens setting. Friday’s premiere had some elements of a new work. The performance was communicative yet sounded cautious at times—Upshaw singing from the texts—-and not entirely lived-in, with a sense of the musicians feeling their way through the score. While Iglesias’s cycle could stand some pruning, particularly in the long middle section, this is an attractive and compelling work and was given a worthy sendoff by Upshaw, Harth-Bedoya and the orchestra. Piazzolla’s Fuga y Misterio served as a raucous prelude to Iglesias’s cycle. The arrangement by Albert Gonzales makes clear that the more instruments are added to Piazzolla’s intimate music, the more schmaltzy and overblown it becomes. Osvaldo Golijov has written several works for Upshaw (including AYRE, which she will return to perform Nov. 17 at Mandel Hall), and on Friday that partnership was represented by his Three Songs for soprano and orchestra. Golijov is a gifted and prolific composer but tends to a certain magpie slickness at times, larding on the ethnic flavoring a bit too self-consciously. Such is the case in the opening setting Night of the Flying Horses with the Yiddish lullaby and klezmer bassoon solos not really cohering with the vocal line. Still, these Golijov songs have an emotional directness that make Iglesias’s cycle seem a bit studied. Upshaw was at her finest in these works, soaring expansively in the melismatic lines of the central Lorca setting Lua descolorida, and haunting in the closing Dickinson setting How Slow the Wind, deftly scored by the composer with tolling bell at the coda. It’s anyone’s guess what Prokofiev’s Violin Concerto No. 2 was doing on this program but there you are. 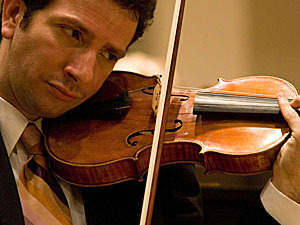 Saint Paul’s concertmaster Steven Copes was the admirable soloist playing incisively and with commitment. Yet the performance felt somewhat small-scale and lacking—partly Copes’ narrow range of tonal coloring and partly Harth-Bedoya’s blandly efficient accompaniment. The final movement brought more fire and excitement from both soloist and conductor but this was not a Prokofiev performance to abide long in the memory.